Norwalk, Connecticut: Easton Press. 1994. First Edition; First Printing. Hardcover. Fine, Accented in 22kt gold, printed on archival paper with gilded edges, smyth sewing & concealed muslin joints. Bound In full leather with hubbed spines. Pristine. ; The Library of Great Lives; 8vo 8" - 9" tall . Oxford University Press. Hardcover. 0195052366 Special order direct from the distributor . New. 1988-11-03. New. Ships with Tracking Number! INTERNATIONAL WORLDWIDE Shipping available. Buy with confidence, excellent customer service! Oxford University Press. Hardcover. 0195052366 New Condition. . New. Folio Society. Hardcover. B000RF8226 New Condition. . New. Oxford University Press. PAPERBACK. 0195061624 New Condition. . New. The Folio Society. Hardcover. B008R9K6FA Folio Edition - Red cloth boards with slipcase. Book is in excellent condition, text is unmarked and pages are tight. Slipcase has very slight shelf wear. . Fine. Oxford University Press. First US edition-2nd printing. Hardcover. Near fine/Near fine. Near fine condition.Oxford University Press,1989.First US edition-2nd printing(2 4 6 8 9 7 5 3).Red hardback with black borders(gilt lettering to the spine) with Dj(two small marks inside the edges of the Dj cover,small nicks and crease on the edges of the Dj cover),both in near fine condition.Illustrated with b/w photos,drawings,map.Nice and clean pages but with small ink marks on the outer edges,two small marks on the edges of the pages.Nice and clean book with light shelf wear on the Dj cover.424pp including Appendix,list of abbreviations,notes,selected bibliography,cast of characters,index.Heavy book(approx 1.1 Kg). Oxford University Press. PAPERBACK. 0195061624 Special order direct from the distributor . New. Hardback. 1989. 430pp, 24 plates Oxford 1989. VG in DW . 1988-11-03. Good. Ships with Tracking Number! INTERNATIONAL WORLDWIDE Shipping available. May not contain Access Codes or Supplements. May be ex-library. Shipping & Handling by region. Buy with confidence, excellent customer service! Folio Society. Hardcover. B000RF8226 Like New Condition. . Fine. Oxford University Press. PAPERBACK. 0195061624 Like New Condition. . Fine. Oxford University Press. Hardcover. 0195052366 Like New Condition. . Fine. New York, New York. : Oxford University Press, 1989. 418 pages, b&w photos, notes, bibliography, index. Has previous owner's initials and original date of purchase in biro on frontispage (plus numerals 8100222). Some very slight staining to pages edges (top). Very good reading copy.. First Edition. Hardcover. Very Good/Very Good. Second Hand. London: Folio Society. 1999. Large 8vo. xxxiv, 532pp, colour illustrations, maps, genealogical table. Full magenta brocade cloth patterned with the double-headed eagle, leather spine label, in the pictorial papered slipcase. A fine clean copy. .
Oxford University Press. Used - Very Good. Great condition for a used book! Minimal wear. London: The Folio Society. Hardcover. pp xxiv, 532. 1st printing. A fine slipcase included which shows some shelf wear underside. . Fine. 1999. 1st Thus. London: The Folio Society, 1999 This book is in near fine condition and has not been read. There is a book plate on the inside of the front cover and on the last page. Beautiful red brocade boards with the letering in gold on a black paste down on the spine. No dust jacket. The slip case is in near fine condition. Illustrated with Catherine the Great astride her horse Brilliant. Second Edition.. Hardcover. Near Fine/Near Fine (Slip Case). 4to - over 9¾" - 12" tall. History, Biography. LONDON, THE FOLIO SOCIETY, 1999. FINE COPY WITH RED SILK BOARDS, IN VERY GOOD SLIPCASE. 532 pp. The Folio Society, 1999. First Edition Thus. Hard Back. Fine/Fine. Very fine copy looks and feels as new in a perfect slipcase. Oxford University Press, USA, 1988-11-03. Book Club. Hardcover. Used:Good. New York: Oxford University Press, 1989. Book Club Edition. good, fair. 25 cm, 418, illus. with 24 pages of plates, maps, bibliography, index, DJ worn, soiled, and some tears. A well researched, well organized, and balanced portrait of Empress Catherine II. First edition of this Folio edition hard back binding in publisher's original sumptuous deep red damask type cloth boards with gilt lettering on black band on spine. Red board full colour illustrated slipcase in as new condition. Pages in as new condition with photographic plates throughout. Folio, 1999. Book. As New. Silk Over Boards. 8vo - over 7¾ - 9¾" tall. Beautiful silk boards unmarked - a fine book with no name (poss. unread) - Slipcase almost very good with a little shelfwear only - 4 Maps & 30 illustrations - Guaranteed posting 24hrs fST78 Size: 8vo - over 7¾" - 9¾" tall. hardcover. Illus. 532pp. Thick 8vo, patterned cloth, leather spine label, slipcase. London: The Folio Society, 1999. Near fine. Published by The Folio Society, London First Thus Edition 1999. 1999., 1999. First Folio edition hard back binding in publisher's original full scarlet Jacquard silk cloth woven by Van Heek-Scholco, with contrasting black morocco label. Quarto 10'' x 6½''. Contains [xxiv] 532 pages, colour frontispiece & 29 colour and monochrome plates, 4 maps, genealogical table, printed on Balmoral Laid paper. Fine condition book in Fine pictorial slipcase showing Catherine the Great astride her horse, 29th June 1762, from an oil painting by Vigilius Erichsen, 1765. Member of the P.B.F.A. NY: Oxford Univ Press, 1989. Back board has slight bend. In very good dust jacket.. Hardback. Very Good. New York: Oxford University Press, 1989. Very good+/very good, hard cover, . Hard Cover. Very Good/Very Good. New York: Oxford University, 1989. 9/10/2008. Fine/Near Fine. Book club edition. Fine in near fine dustwrapper with age-toning to the rear panel. Illustrated with black and white photographs. New York: Oxford University, 1989. Softcover. Near Fine. Sixth printing. Trade paperback. Near fine. Reader's creases in spine. Please Note: This book has been transferred to Between the Covers from another database and might not be described to our usual standards. Please inquire for more detailed condition information. London, United Kingdom: The Folio Society, 1999. 1st. Hardcover. Very Good. Red cloth boards with gilt lettering and red graphics. FIRST EDITION THUS. Numerous illustrations. The illustrated slipcase is in like condition. 532 pages. Weight over 1 lb. Oxford Univ. Press, 1989. (Book Club--unstated) Large, heavy book, 418 pages. DJ has very slight wear along front bookfold edge, very slight surface wear to spine top edge, very tiny scratch at spine bottom edge. Near Very Good DJ/Very Fine book.. Book Club (BCE/BOMC). Hard Cover. Fine/Near Very Good. The Folio Society, 1999. First Edition Thus. Hardback. Fine/Fine. Type: Book Very fine copy looks and feels as new in a perfect slipcase. New York and Oxford: Oxford Univ. Press, 1989. Hardback. Very Good/Very Good. Book Club. Folio Society, 1999. Hard Cover. Like New. Like new book! In original slipcase. Unread, purchased from a Folio Society collector. No ownership marks nor labels. (Shelf location: CX2) All items carefully packed to avoid damage from moisture and rough handling. Tracking included. Oxford University Press, USA, 1989-11-09. 1rst By Oxford University Press. Paperback. Used:Good. The Folio Society, 1/1/1999. Hardcover. Like New. Hardcover in slip case. Fine binding and cover. Light wear to slipcase. Clean, unmarked pages. Ships daily. Folio Society, 1999. Hardcover. Book is as new, clean, tight & bright condition in a near new but slightly rubbed slipcase. 532pp., bibliography, index. New York: Oxford Univ Pr, 1989. Paperback. Very Good/No Dj. 8vo. pp. xii 3 418. London & Edinburgh: Folio Society. Fine. 1999. First Printig... Hard Cover With Fine Slip Case. FINE First Folio with FINE slip case. Size: 4to - over 9¾" - 12" tall . NEW YORK: OXFORD UNIVERSITY PRESS. VG-/G+ LIGHTLY EDGEWORN. LIGHT SOILING TO PAGE EDGES. Pages: 418. . 1989. BOOK CLUB. HARDCOVER.. DJ EDGEWORN, A FEW TINY CHIPS & TEARS. TEXT CLEAN, BINDING TIGHT. . Condition: VG-/G+ LIGHTLY EDGEWORN. LIGHT SOILING TO PAGE EDGES. Pages: 418. The Folio Society, 1999. Hard Cover - VG - No dust jacket if issued - Book is clean and tight with light wear - Illustrated - Index - 532 pages.. Hard Cover. Very Good. UK: Oxford University Press, USA, 1988. Hardcover. Very Good/Good. 9.6 x 6.5 x 1.4 inches. Book Description Catherine II of Russia is one of the most colorful characters in modern history. Born a minor German princess, she was betrothed to the Grand Duke Peter of Russia at 15, through the designs of the childless Empress Elizabeth and her own scheming mother. By 33, she had overthrown her husband in a bloodless coup and established herself as Empress of the multinational Russian Empire, the largest territorial political unit in modern history. Portrayed variously as a political genius who restored to Russia the glory it had known in the days of Peter the Great and a despotic foreign adventuress who usurped the Russian throne, murdered her rivals, and tyrannized her subjects, she was, by all accounts, an extraordinary woman. Catherine the Great, the first popular biography of the mpress based on modern scholarship, provides a vivid portrait of Catherine as a mother, a lover, and, above all, an extremely savvy ruler. Concentrating on her long reign (1762-96), John Alexander examines all aspects of Catherine's life and career: the brilliant political strategies by which she won the acceptance of a nationalistic elite; her expansive foreign policy; the domestic reforms with which she revamped the Russian military, political structure, and economy; and, of course, her infamous love life. 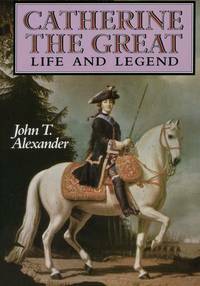 Alexander begins with an account of the dramatic "palace revolt" by which Catherine unseated her husband and a background chapter describing the circumstances of her early childhood and marriage, then proceeds chronologically through the 34 years of reign. In compelling narrative fashion, he describes such events as the incursion of bubonic plague on Moscow, the uprising of the Ural peasants, and the six political murders the empress sanctioned. Catherine is presented here in more human terms than in previous biographies, with numerous quotations included from her reminiscences and notes. We learn, for instance, not only the names and number of her lovers, but her understanding of what many considered a shocking licentiousness. "The trouble is," she wrote, "that my heart would not willingly remain one hour without love." The result of 20 years' research by one of the leading narrative historians of modern Russia in the U.S., this is truly an impressive work. Alexander delved into little-known sources (including a collection of Catherine's love notes which is included here as an appendix) as well as popular and specialized accounts to arrive at this much-needed, balanced appraisal of one of history's most scandal-ridden figures. Oxford University Press. PAPERBACK. 0195061624 . Very Good.